DRM has two full-time attorneys who represent children with disabilities who are seeking assistance with obtaining a free and appropriate public education. DRM’s education priorities include: representing children with disabilities who have been excluded from school for more than 10 days in a school year; ensuring that children with disabilities have access to the least restrictive education environment; protecting students from abuse and neglect; advocating for appropriate transition services to support the movement from school to employment, further education and independent living; responding to school based discrimination; accessing assistive technology devices and services in the school; and and providing representation in cases where there are significant denials of the right to a free and appropriate public education. In addition to individual representation, DRM provides training on educational rights to students, parents and professionals. 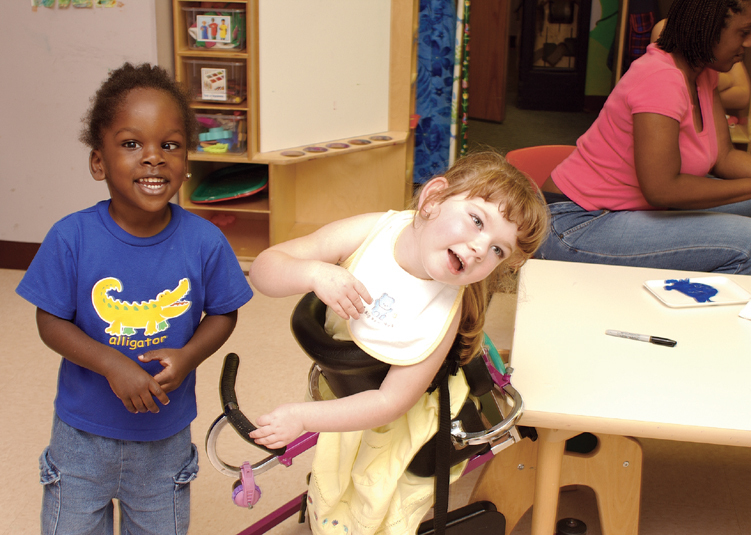 Disability Rights Maine is pleased to announce the expansion of our children’s advocacy services through the addition of two statewide Children’s Advocates. The Department of Health and Human Services, on behalf of the Office of Child and Family Services, has contracted with DRM for these positions. In addition to individual representation, DRM conducts outreach and monitoring of children’s services in the community, hospitals, residential treatment facilities, and out-of-state placements. The parent of a high school-age student with a mental illness contacted DRM about concerns that the student was not placed in the least restrictive environment (LRE) on return from a lengthy stay in a residential setting. The student lived in a part of the state where his local community did not operate a high school and did not have any agreement with any particular high school requiring its students to be accepted. Instead, the students had school choice, where tuition was paid to any number of high schools in the region. No school would accept the student due to their concerns about his past behaviors and he was without a school. Eventually, his home district placed him in a segregated private day treatment setting because that was the only available option, despite the fact that the student was not exhibiting any need for such a restrictive placement. Efforts seeking another placement were fruitless because no school would accept him. DRM filed a due process hearing against the resident district, where an agreement was made to withdraw the hearing without prejudice to allow the student's chosen evaluator to conduct an evaluation, at school district expense, to be used as a basis for securing admission to the student's chosen high school. But even after a very favorable evaluation, indicating that the student was little to no risk to himself or others, schools in the region would not make a placement available. DRM filed another due process hearing against both the local district and the Maine Department of Education due to the fact that both entities had failed to ensure a continuum of placements was available for the student. A negotiated settlement agreement resulted in the student attending his chosen high school with transportation, and in a mainstream setting with appropriate supports. Note: Following this case, and other similar cases raised by both DRM and attorneys at Pine Tree Legal Assistance, the Maine Department of Education proposed a legislative fix to address the problem of students, especially students with disabilities, securing enrollment in schools where their community does not operate a school or contract for enrollment of its students in any specific school. The proposed legislation would give the MDOE the authority to designate a school of enrollment for a student in this situation. While MDOE has the ultimate legal responsibility to ensure students with disabilities have available to them a continuum of alternative educational placements and access to the least restrictive environment, MDOE does not currently have a clear statutory path to fulfill this responsibility. LD 1576 was proposed to remedy that. You can follow the progress of LD 1576 here: http://legislature.maine.gov/. DRM was contacted by the parent of a Kindergarten student who had been suspended from school pending a risk assessment and then not allowed to return while special education evaluations were underway. The student’s mother had requested a special education evaluation due to periods of agitation, aggression, impulsivity and hyperactivity resulting from several mental health diagnoses. While this evaluation was underway, the student was hospitalized. While the student was in the hospital, the school suspended the student pending a risk assessment due to concerns about his behaviors. After the risk assessment was completed, the school district convened an IEP Team meeting and informed the parent that the student would be offered two hours of off-site tutoring services during the evaluation period, which could last up to 45 school days. The parent objected to this change and sought other options, such as a return to the kindergarten classroom with additional supports. But no other options were given. Although the IDEA requires that advance written notice be given prior to changing an educational placement, the student’s removal from school to tutoring was effective immediately. And although the IDEA requires that a manifestation determination be held before removing a student to an interim alternative educational setting, no manifestation determination was held. DRM sought review of the removal of the student to an interim alternative education setting in an expedited due process hearing. There was no dispute that the student was entitled to the protections of the IDEA, such as a manifestation determination, prior to being subjected to a change in placement. DRM argued that from the moment the student was removed from his kindergarten classroom, first through a suspension and later through placement on tutorial services, he was subjected to a change in educational placement based on violations of the student code of conduct. But the district argued that the removal was not a “disciplinary” removal, and that the placement on tutorial services was a valid placement based on the student’s needs. And despite the fact that the hearing officer found that the student had not been returned to his school classroom at any time following his initial suspension through the date of the hearing, (a period in excess of 45 school days), and despite the fact that no manifestation determination had been held, the hearing officer focused on the period of suspension and the period of time before tutorial services were available to the student, and found that his change in placement did not exceed 10 school days so no manifestation determination was required. DRM is currently seeking review and reversal of this decision in the federal district court. Stay tuned for updates! Note: The use of “tutorial services” as a way to provide education to students exhibiting challenging behavior is widespread across the state. Students are often placed on tutorial services because the school does not have the resources or the will to appropriately address their needs. Often parents are provided little to no choice in the matter. And tutorial placements that are presented as temporary can drag on for months. This is inappropriate. Stopping this practice is a high priority for DRM and we encourage parents, guardians, surrogate parents, case managers and others working with children who have been placed on tutorial services to contact our office to discuss whether their child’s right to be free from unilateral removals as a result of behaviors and right to an education in the least restrictive environment has been violated. DRM provided information and technical assistance to an 18-year-old young man with Autism and his mother/legal guardian regarding discharge planning from an out of state residential treatment program. During a monitoring visit to an out of state residential treatment program, the advocate provided information the client about his rights, as the client had requested assistance to advocate for appropriate discharge planning to a Maine program closer to his family. The advocate also provided his mother and legal guardian with information regarding the client's rights and services that he may be eligible to receive in Maine. The mother was able to successfully obtain a case manager and secure services for her son. He has successfully transitioned to his own apartment with support in Maine. DRM was contacted by the parent of a 3-year-old child with autism after receiving an inappropriate denial of service letter. The client was receiving services under Section 65 Behavioral Health Day Treatment, which allows for intensive services in a school setting. The service is designed to provide early intensive intervention for children with autism, which is universally recognized as best practice including by the Maine Department of Health and Human Service state of the evidence report from 2009. The service utilizes Applied Behavior Analysis practices. In the course of the representation, two more parents of children in the same program contacted DRM to represent them in their denial of service. DRM successfully represented the client at hearing, restoring all services. The two subsequent cases were approved without an administrative hearing. Does your child participate in after school activities? Are they interested in joining a program but you're not sure what their - and your - rights are? Download our latest fact sheet to learn how the Americans with Disabilities Act (ADA) protects your child - and you! "The Procedural Safeguards set forth in the Maine Unified Special Education Regulations are the rights that apply when children are: in the referral process for special education: or already identified under special education; or whose parents believe should be identified under special education. If the student is an adult student, the rights apply to the adult student. The School Administrative Unit must provide a copy of the Procedural Safeguards to parents or adult students once a year, and more than once a year if specifically required under the regulations. Strong advocacy by parents and students depends on their awareness of both these safeguards and the rights those safeguards protect. This document in no way is intended to replace Maine’s Procedural Safeguards Statement and does not cover, in detail, all rights included in the official document. As the parent of a child receiving special education services, you should read Maine’s Procedural Safeguards and use this document to help explain them. If your child is under the age of 5, Child Development Services is the child’s school." Are you planning to send your child to camp this summer? Download our fact sheet for information about your child's right to participate in summer programs! Parent Power is a support group through Thrive that brings together parents, guardians and family members of at-risk youth to share support, information and experiences with juvenile justice services. The Juvenile Justice Clinic at the University of Maine School of Law (JJC) was established in 2006 to provide law students the opportunity to address the needs of troubled children in a number of diverse settings. Student attorneys represent juveniles in delinquency proceedings and in post-disposition matters. The JJC also helps youth and adults who are seeking to seal their juvenile records by providing information and, for eligible clients, direct representation. Click the link below to download the JJC's brochure, which provides helpful information about we you need to know if you have a juvenile record in Maine. This is a PDF version of Atlee Reilly's summer 2017 rights training for case managers & other professionals. This tool is to help YOU (the student)! This guide encourages you to think about your self-determination, work/employment, independent living, and education/training. "This is a guide developed by young people in partnership with adult providers. It is a guide to make sure you as a youth are provided with the information you need in order to have ‘informed consent’ when making medication decisions about antipsychotic medications." This guide is made possible by a partnership of: Youth MOVE Maine, Maine’s Youth Leadership Advisory Team (YLAT) and Maine’s Department of Health and Human Services (DHHS). The Department of Health and Human Services is pleased to have partnered with a variety of State of Maine agencies, private service providers, and valued community members to bring you A Guide to Transition Services in Maine. The transition to adulthood has many exciting opportunities and pathways. I hope A Guide to Transition Services in Maine will provide you with valuable information, ideas, and resources to assist in the journey. These rules apply to all facilities providing inpatient psychiatric services and to all agencies, facilities or programs providing inpatient, residential or outpatient mental health services which are licensed, funded or contracted by the Department of Health and Human Services, including state operated institutes and facilities. * This document is available in both PDF and Word formats. How do I file a grievance?Where do I send my grievance form? What do I do if I do not agree with a decision made in the grievance process? Where can I get help with my grievance? Recorded on August 26, "What Families Need to Know About Accessible Instructional Materials" was an hour-long discussion about students who have trouble reading materials, such as textbooks and workbooks due to a "print disability." In the opening presentation by Cynthia Curry, we discussed how to determine if your student has a "print disability" and how Accessible Instructional Materials (AIM) may help. We also spent time with the "microphones open" allowing participants to ask questions and discuss details. DRM Advocates Katrina Ringrose & Mary Myshrall attend Children's Mental Health Awareness Day at the Hall of Flags on Friday, May 6, 2016. This event was hosted by G.E.A.R. Parent Network, with DHHS Children’s Behavioral Health Services and Youth M.O.V.E. Maine, a program of Thrive, serving as co-hosts. 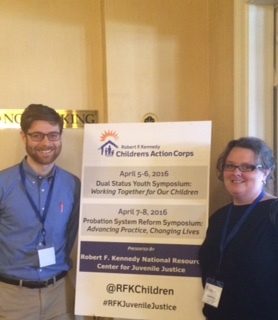 DRM's Ben Jones, staff attorney, and Katrina Ringrose, advocate, recently attended the RFK Children’s Action Corps' Dual Status Youth Symposium: Working Together for Our Children. This event was the first of its kind national gathering of multi-disciplinary, youth-serving professionals to learn, network, and become part of the nationwide movement to improve outcomes for dual status youth. The symposium presented a unique opportunity to experience and share the outstanding practice and policy progress made over the past fifteen years in addressing the challenges of effectively serving youth who touch both the child welfare and juvenile justice systems. Several years ago, after a long process involving stakeholders from schools, administration, parents, and advocacy groups (including Disability Rights Maine), the Maine Department of Education promulgated Chapter 33, which governs the use of restraint and seclusion in any entity receiving education funds through the Maine Department of Education. Chapter 33 mandates that the use of restraint and seclusion be limited to emergency situations, where there is a risk of harm to the student or to others. Chapter 33 also requires record keeping and reporting of these incidents. DRM is working on a report that will focus on the data collected by MDOE pursuant to Chapter 33 for the first three school years where the rule was in effect: 2012-2013, 2013-2014, and 2014-2015. DRM obtained data from the state and made additional data requests for building level data to over 40 local school districts. The analysis of this information, coupled with information from DRM’s own files and those of other advocates and attorneys, will be compiled in a report to be released during the summer of 2016. Initial takeaways include the following: a) it appears that students with disabilities are disproportionately subjected to restraint and seclusion, with very high numbers concentrated in special purpose schools and settings that only serve students with disabilities; b) there appear to be instances of significant underreporting in the date reported to MDOE, with some entities failing to report any data whatsoever; and c) although Chapter 33 requires that the data be reported quarterly to the school superintendent, who is charged with the responsibility of identifying “areas that can be addressed to reduce the future use of physical restraint and seclusion”, very little appears to be happening in this regard. DRM will continue working with the MDOE to gather data and with other community partners to complete the report for release this summer. Stay tuned! For information on Chapter 33, see: http://www.maine.gov/doe/school-safety/restraints/ . If you have concerns about the use of restraint and seclusion in your area, please contact DRM to speak with an attorney or an advocate. DRM, in collaboration with the Office of Child and Family Services (OCFS), developed a comprehensive rights training based on the Rights of Recipients of Children in Need of Treatment (RRMHS-Children). Currently DRM provides this training with a representative from OCFS to Child Welfare workers statewide. Since November 2015 advocates provided four trainings reaching a total of 112 people. Four more trainings have been scheduled at OCFS district offices. DRM looks forward to offering this training to service providers and youth receiving treatment in the near future. Please contact us if you are interested in learning more about this training opportunity.